We’ve got one more pumpkin recipe for you before we head back to sampling recipes from the Philippines. This particular dish makes use of the leftover roasted pumpkin we had from our risotto and makes for a great lunch or side salad. If you don’t have any leftover pumpkin on hand, it’s simple to roast up a fresh batch, just allow for an extra hour of cooking time. 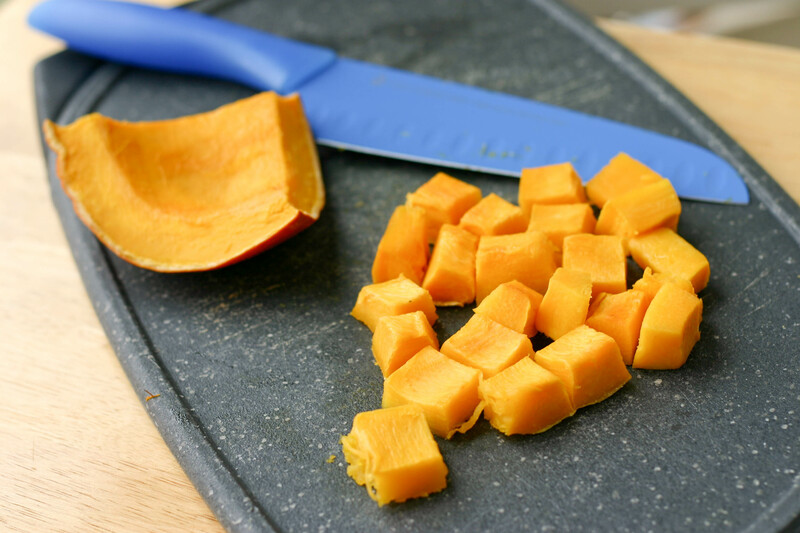 So what is this easy, tasty and refreshing pumpkin recipe? 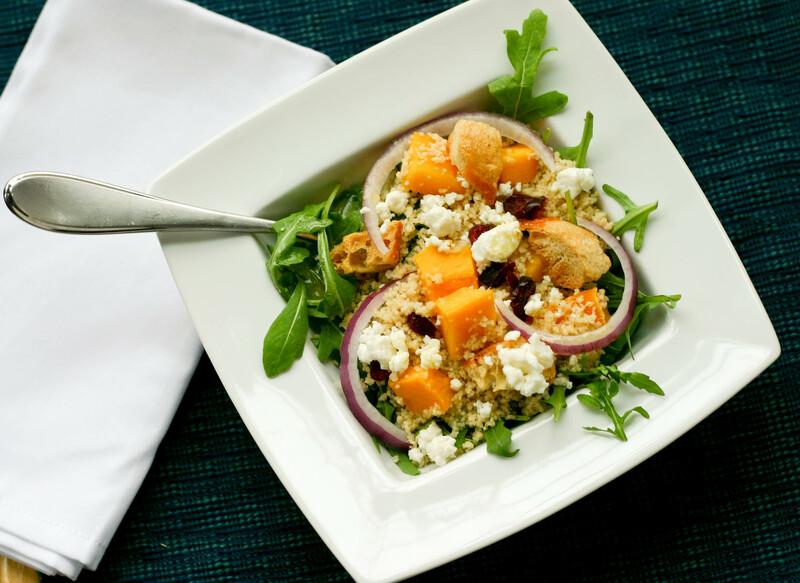 The Pumpkin and Couscous Rocket Salad. Yep, it’s healthy and offers some much-needed freshness after all the Halloween sweets and treats. We started by preparing our couscous. 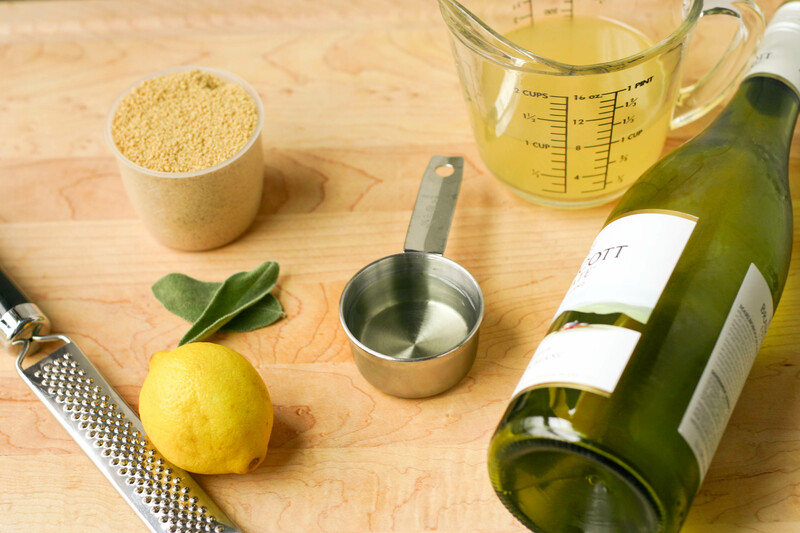 We used a whole wheat couscous, chicken stock, dry white wine, fresh sage, lemon zest and lemon juice. We boiled the chicken stock and white wine together in a small sauce pan and then combined the couscous, minced sage, lemon zest and lemon juice in a heat proof bowl. 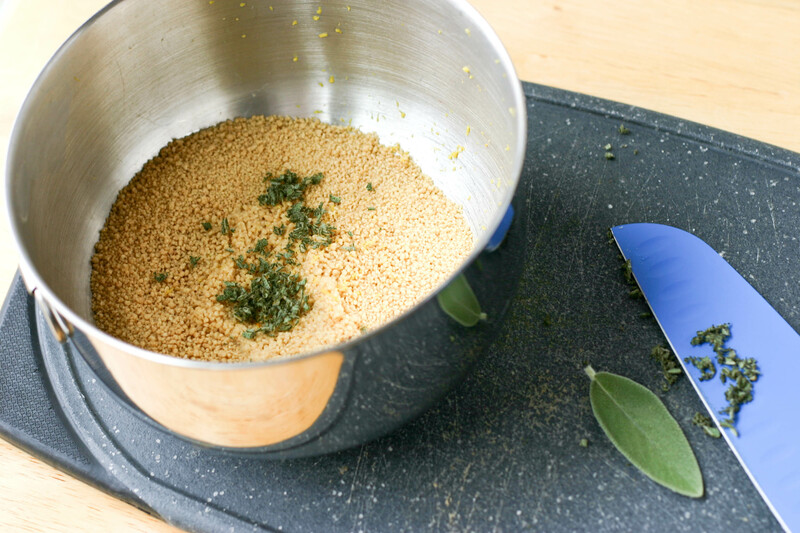 We added the boiling stock to the couscous mix, covered it and set it aside for five minutes. We then cut up our leftover pumpkin slices into one-inch cubes. 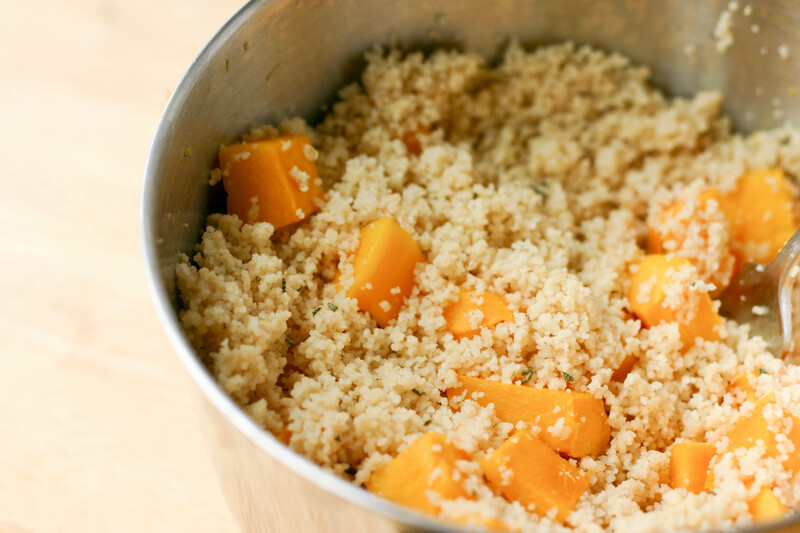 When the couscous was ready, we tossed in the pumpkin. 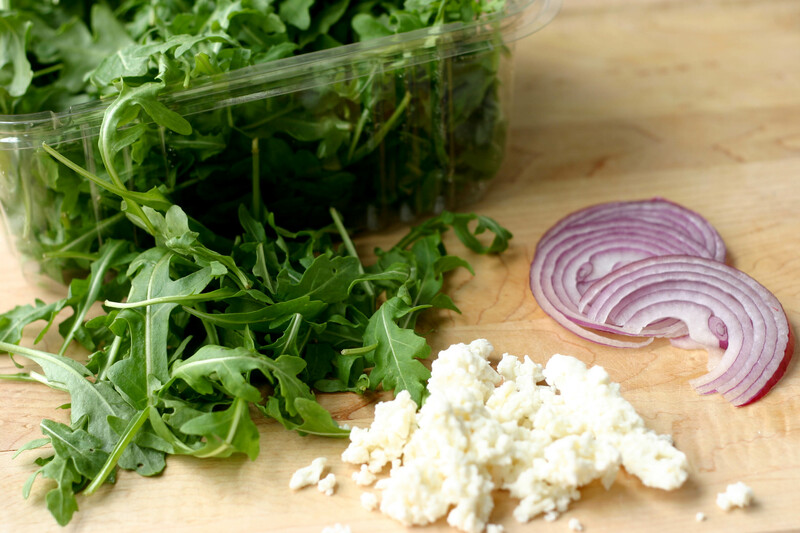 Then we grabbed our rocket (arugula), feta and red onion slices. We plated the arugula and added a bit of lemon juice over the top. 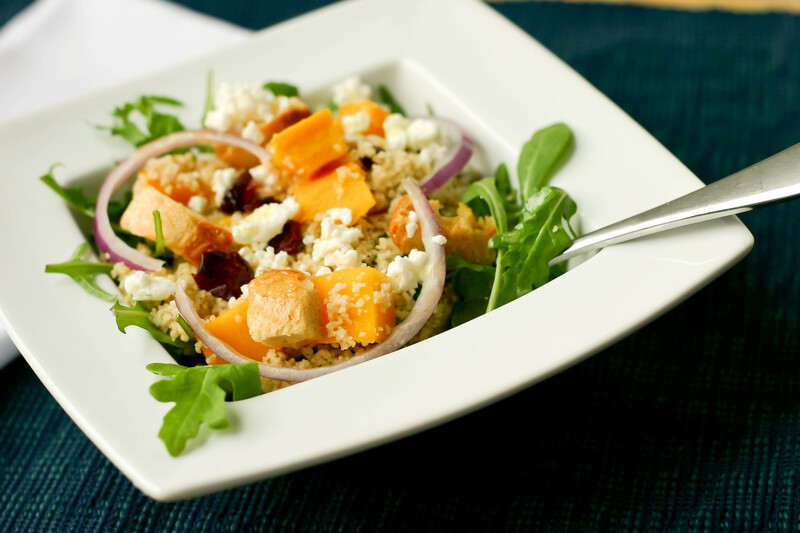 Next we scooped out some of the pumpkin couscous over the greens, topped that with feta and onion slices. We also threw on a few dried cranberries just for fun. 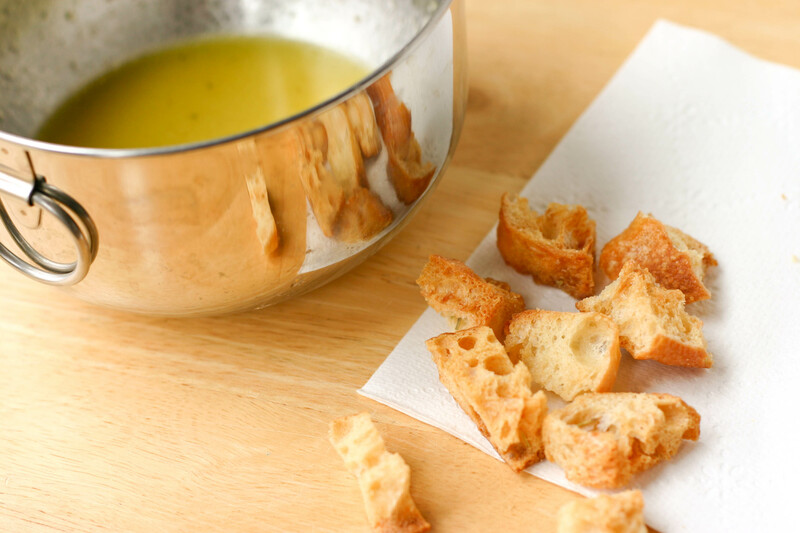 Next we made a homemade lemon vinaigrette and grabbed our homemade croutons from a few days earlier and tossed those over the top as well. A final splash of balsamic vinegar and that was it. Our meal was ready to go. This is another dish that just Mike and I enjoyed albeit not together. Thursday was one of those days that we were all running in different directions and grabbing meals when we could. I ate my salad as an early dinner on my way out the door and Mike ate his as a later dinner after work. The kids, well, with as much cooking as we’ve done this past year, chicken nuggets have become somewhat of a rarity. And since they’re not big on salads, or pumpkin, and they still LOVE chicken nuggets, we figured they were due for a little treat. Needless to say, they were in heaven! Chicken nuggets and a night with their Papa who is full of games, stories and fun. I don’t even think Mike and I were missed. As for our quick salad dinners, it wasn’t bad as far as salads go. It’s light, quick, refreshing and easy. I gave the salad 3 spoons and Mike gave it 2 spoons. He said it was good, but not memorable. I rarely find a salad really memorable, but I do enjoy them and will make this one again, so I’m still giving it higher marks. The highest marks go out to Papa though – I came home to a clean house and clean children that were sound asleep. Thanks again Papa! This looks so delicious and I love how healthy it is as well… my kind of dinner! 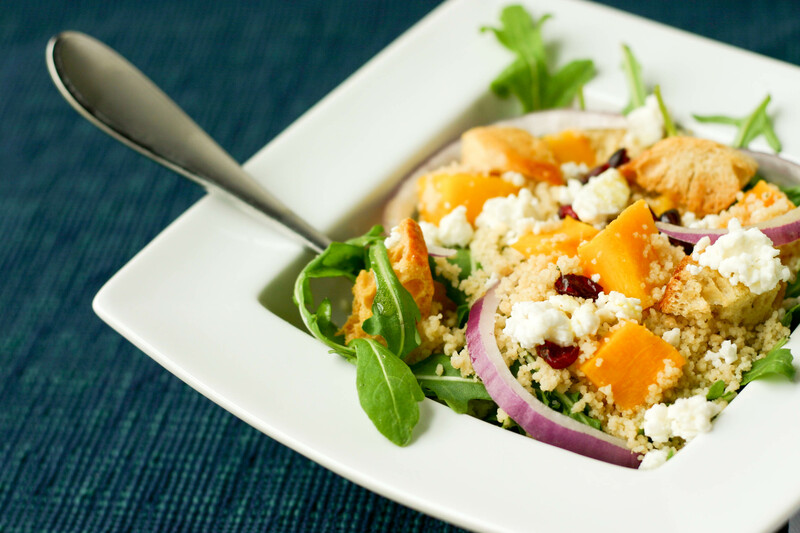 Love couscous, love pumpkin and love salad so why wouldn’t I love this dish! It is perfect and so light but delicious. Love the rocket part of the title! LOL! Yes, I’m sure they missed us. And believe me I missed them. I’d much rather have been home with them than sitting in traffic for two hours on my way to a work function. 😦 Next time we leave the kids – I’m hoping it will be for date night! Anyways enough about that, your salad do look great, I had tried something similar here but they also add sweet potatoes on it. Love it! Good job, Papa – always a treat to come home to that. And I think the salad looks really intriguing, too. I love your salad..colorful and full of flavor and that vingrette sounds like one I would love..
It’s definitely lemony! 🙂 Honestly, living close to our parents is the best part about having moved back to this area. It’s so nice having their help. I don’t know what we’d do without them. This is a meal that I would love but my husband would be like Mike. When I ask him if he would like salad with dinner he just makes a face. I could eat it every day of the week. Poor old salads – no-one seems to find them memorable 😀 I love couscous though – isn’t it so fantastically easy to cook? “Oh, slosh on some boiling water and leave for a bit” – good times 🙂 Feta and big slices of raw, red onion? Heaven for me – although I think I’d add in some black olives too – they just seem to go so well with feta and onion! Your photography is so good now Kristy – amazing, just so beautiful! Did you try to submit any of your posts to foodgawker or tastespotting yet? LOL! I like the “poor old salads.” 🙂 Now if I skipped the pumpkin and put in olives for Mr. N he would definitely enjoy this salad. 🙂 Good thought for next time. Thanks for the feedback on the photos Charles. I really appreciate it. I have submitted a few to foodgawker and tastespotting. I have trouble with the square format thing. If I crop the photo to a square the composition goes out the window. I’m not sure how to keep the composition in that format. Is there a trick? I Kristy, last night we made couscous the traditional Moroccan way, and you wouldn’t believe how much work it is! It took about an hour, start to finish, and without spoiling the recipe when I get home, let’s just say you’re up ’till your elbows in hot couscous! Kristy, your photos and recipe are amazing. I love that it’s a healthy but satisfying meal hearty enough for a fall dinner. I absolutely love this one. Look at that first photo, it’s gorgeous! Kristy, this is fabulous!! You know how I love my pumpkin!! I’ve added a link feature to my last post on a Salads for Thanksgiving. If you’d like to share this salad, please stop by and link up!! Thanks Linda! I thought you might like this one. 🙂 I added the salad to the link up. Thanks! LOL! There are definitely times Mike and I just step back and marvel at them. 😉 Thanks Sally. I think I’m going to make this salad again tomorrow for lunch. Omg, this is my favorite salad. I made something simlar last week though I used quinoa and boiled it in plain old water! lol I topped it to with pumpkin and cranberries though I usually add feta but ran out so ate it w/out cheese. I love salads and can eat them all day long. LOL! I don’t think he’s available for hire. 😉 And yes, this would be a great salad for after Thanksgiving!